Jacks or Better video poker is one of the most well-known games in Las Vegas casinos and in fact, casinos around the world. It's certainly in the top 5 video poker games out there and most visitors to Vegas have played at least a hand or two. The main twist to this poker game is, as the name suggests, in the fact you get a win if you have at least a pair of Jacks. Or Better. The game is similar to, but has slightly different payouts and required tactics to games like Deuces Wild. Interestingly enough, the first poker machine appeared much sooner that most of us could even imagine. In the late 19th century, a drum operated mechanism was created by Sittman &Pit and the players would pull the lever to generate a card combination. The machine evolved in early 20th century when a “hold” feature was added, allowing the players to freeze certain cards for the next spin – much like Sticky Wilds in the modern day slots. In the 70s, a Video Poker machine as we know it today was born and by the 80s, Video Poker was offered throughout casinos and bars across the globe. 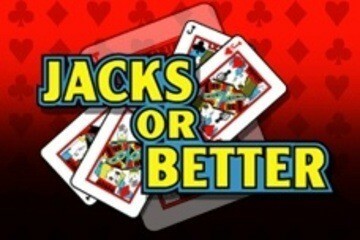 How to play Jacks or Better Video Poker? The edge of Jacks or Better Video Poker is taken off by the fact that you are playing against a machine and not an actual dealer, avoiding any additional pressure. The game follows the same set of basic rules as the five card draw variation, starting with five cards dealt to the players after the bets are submitted. The players then selects the cards that they would like to hold on to and draw again. In this particular version, at least one pair of Jacks is needed for a payout to be awarded. Although playing Video Poker will eliminate the need of memorising the names and values of poker hands since the machine will automatically display the results on the screen, knowing how the hands are ranked is the absolute basis of playing any poker variation. * High card in this case would be a Jack or any other card that exceeds Jack in value – King, Queen and Ace. Is there a way of reducing the house edge in Jacks or Better? To further improve your odds, make sure to always hold your pairs. Each hand should be regarded in terms of its combinative potential and discarding any cards that can form a pair is far from a wise strategic move. Not the easiest game to find, but venues such as Boyd Gaming and Plaza Las Vegas are famous for their over 100% RTP Video Poker machines, including Full Pay Jacks or Better variant. Here, we have a totally free version of Jacks or Better. You do not need to download any software, or sign-up to play. Even better, this is the exact same version that you would find in Las Vegas casinos, like MGM Grand and Bellagio. If you have been to Las Vegas and played video poker, you will certainly have seen Jacks or Better as one of the options to play. The most popular version (by a mile) is made by a company called Game King and we have the free version here!